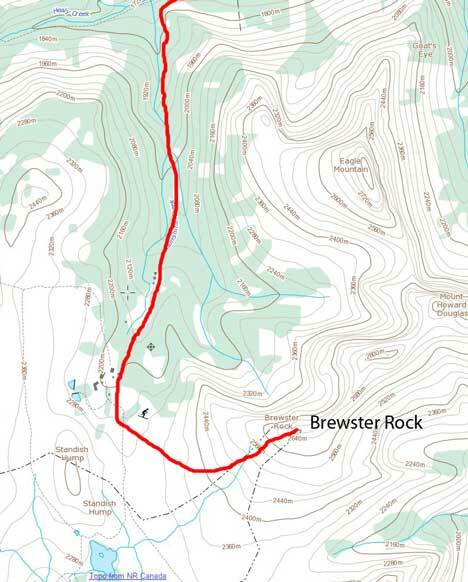 I’ve been planning on a ski ascent of Brewster Rock for a long time, and finally decided to go for it as a solo ascent under miserable weather. 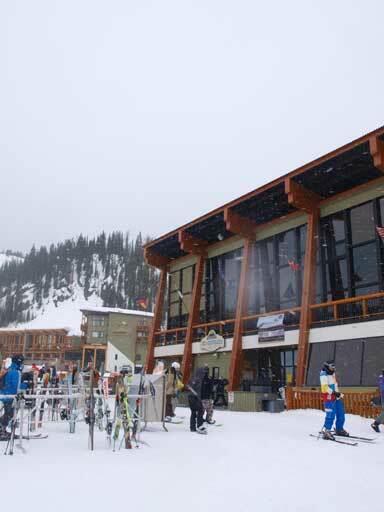 Sunshine Village named this peak “Lookout Mountain”, but the official name is Brewster Rock. I prefer the official name. 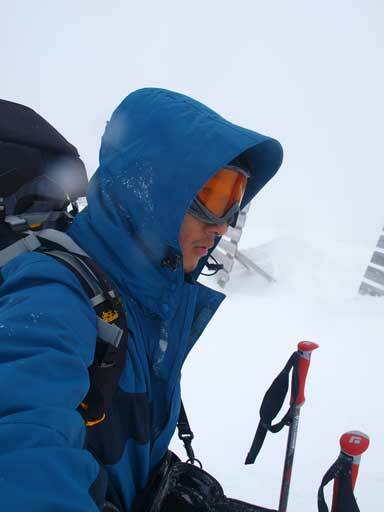 Based on the wind I’d just experienced on Survey Peak the day before, I knew exactly what’s gonna happen because the weather forecast was only getting worse. Massive Mountain should probably be the only one I could almost completely avoid the wind and still relatively safe as a solo trip, but I just wasn’t in the mood of doing another 6-8 hours of bushwhacking, and this time would be by myself. That would make a miserable trip even worse. 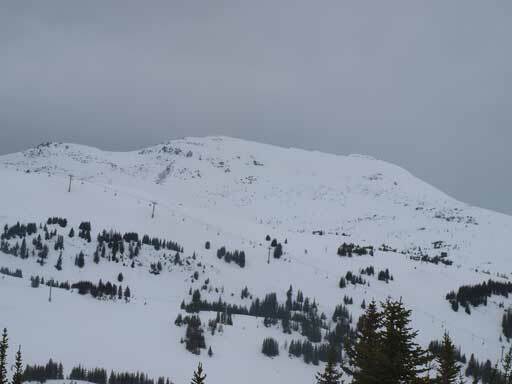 So I thought the only option to make a miserable solo ascent better was to ski it, and then I quickly checked the Sunshine Village report, and the ski-out was still open. Very good. It would be the day to test my ski boots. 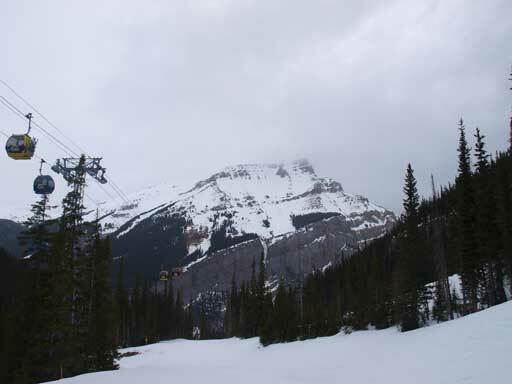 Another reason why I really wanted to squeeze a ski ascent at the end of this season was, I might can catch up a trip up Columbia Icefield in May. I had everything ready except for my boots. As long as my boots stop setting me blisters I’m good to go. So I’m quite excited. Since I would be in a ski resort for all day, I opted to wake up late despite the warm temperature. 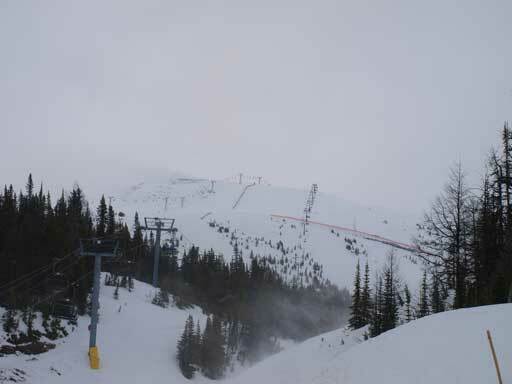 The weather was okay in the morning though, but soon got worse when I got to Sunshine Village parking lot. Blue sky disappeared and it felt like just about to rain/snow. I quickly got my gears ready. My pack would be very light this time because I didn’t need to bring ice axe nor crampons. I slowly skinned up the ski-out, and at about 0.5km my right foot started to feel painful just like the day on Bow Hut approach. I very appreciated the fact I was soloing since then I could just stop and tighten or loosen the straps. It went very slow since I must have stopped 5 times figuring out a way. Eventually I found the best solotion was, to unstrap all straps except for one. That worked for the rest of the ascent, and I never let even one blister developed. Awesome! 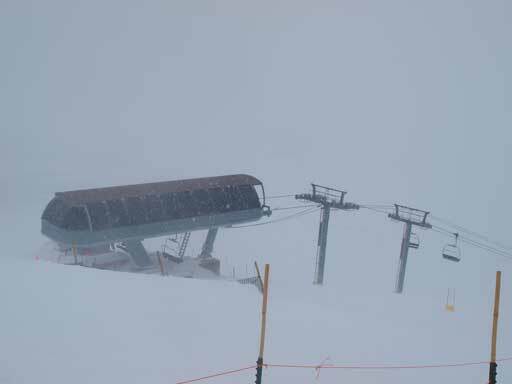 Snow started to fall not far up, and by the time I got to the base of Goat’s Eye chairlift the wind picked up too. Turning left would be going up Eagle Mountain again which I had already done in the previous year. I stayed on right, and it didn’t take me long to reach the village, where I could get a quick break with warmth. Gearing up at parking lot. Mount Bourgeau from the ski-out. I was skiing in though. By this time it looked like the upper slope would be very windy, and the views would be gone, but I still decided to give it a go. Don’t forget I’m a peak-bagger.. So out I went. I quickly gained elevation towards climber’s right aiming for the least steep area, and then not far up I noticed all of the chairlifts in this area were shutted down. 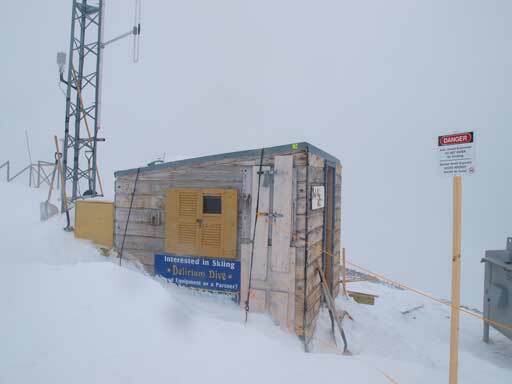 I could see the weather was closing in, and by the time I reached the middle part traverse that’s marked by orange fences, a ski patrol came down and told me the mountain was shut down and I had to go back… Oh shoot, no way! After explaning why I wanted to go up and my experience, he decided to let me go. What a nice guy! The wind indeed picked up and the blowing snow became sideways. It was very miserable. If it was on a open slope I would have turned back here, but for Brewster Rock, I had multiple man-made lines including the chairlifts and ski area boundaries to guide me up in a near white-out condition. I could manage to skin up quite a while until almost at the top of Angel Chairlift, where the snow got very icy and I couldn’t skin up without slipping backwards. 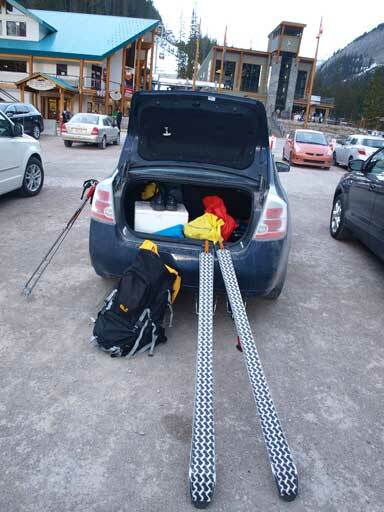 I would love to ski all the way up though but since the snow was that hard, I just ditched my skis and bootpacked up. It was still about 200 vertical meters to go from here. The higher I went, the worse the condition was. And by the time I made to the summit I couldn’t see anything except for some man-made features. The wind was so strong so that I could barely stand there without being blown away. I didn’t want to stay any longer so after a few photos I quickly went down the line I came up. 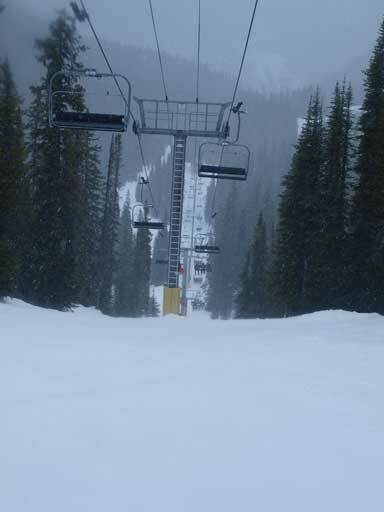 I would pretty much follow this chairlift up. There exists a green line further climber’s right of Continental Divide chairlift, but I didn’t know that so I skinned up a blue run. Twin Cairns. I had some good memories from its snowshoeing ascent. 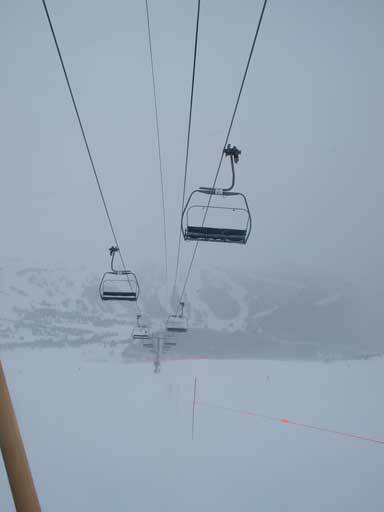 As soon as I started to lose elevation for a bit, the visibility started to come back for a bit, and I corrected located the Angel Chairlift top, and followed the lift back to where I ditched my skis. I doubt if I would enjoy the skiing in this kind of condition, but I opted for taking the challenge. The main goal for this trip was to get more skiing experience, and it was good to know what’s about skiing in miserable condition. It wasn’t a total white-out at this elevation. The first couple turns were a bit awkward since I hadn’t been skiing for a long time, but I quickly found the feel, and the rest of the descent back to treeline was awesome. I wished the terrain to be steeper so I could have some challenge, but oh well, I would go find some black runs lower down anyway. 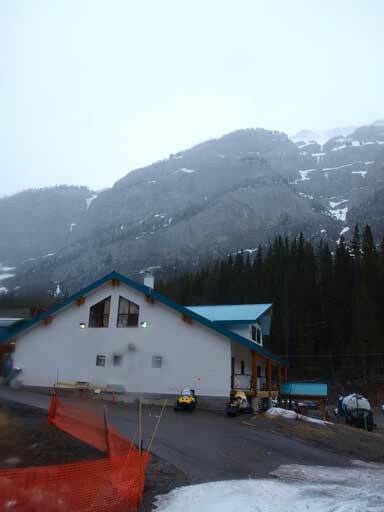 There was no sign of any improvement of weather so I didn’t bother to wait in the warm lodge. 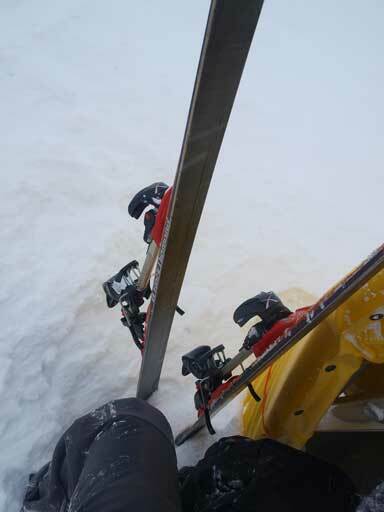 I also didn’t like to leave my skis out, unlocked. Anyone can just grab my skis and go down. So lower down, I took a chance taking one of the smaller lifts up. It was busy so nobody was bothering to check if I had the ticket or not. I skiied down the black run right beneath the chairlift, slowly, but didn’t fall. Good. Then I followed another set of blue and green runs down, deviating from the main trail, and ended up too low at another chairlift. I had to either skin back up or take this chairlift up. I opted for taking the chairlift. The guy should be kind enough to give me another ride and he did. This one was quite long and brought me back up to the top of first chairlift. I paid more attention to route this time, and still got a chance to practive another black run. Didn’t fall this time neither. Once back to the main trail it was a relaxing descent except for the lower part where snow got isothermal. Ready for skiing in the weather! It was raining at parking lot. Overall, I proved that I do can avoid getting blisters now, and I got a tens of skiing, plus one peak. 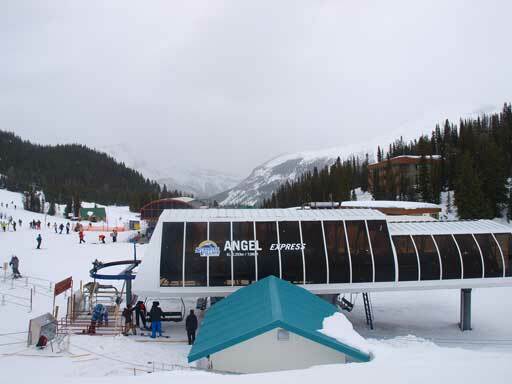 The only bad part was the weather, but whatever, I would come back here for skiing anyway. Now I finished all peaks in Sunshine Village except for Mount Howard Douglas which is a summer scramble. I’d like to repeat any of the rest on skis. And, the next day.